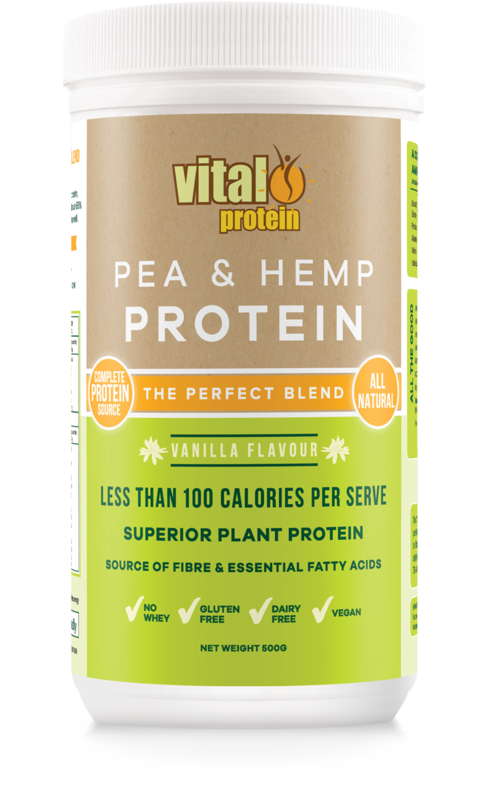 Introducing the newest addition to the Vital range, the Vital Pea & Hemp Protein blend! With 30% Canadian hemp protein powder combined with our Vanilla Vital Protein (70%) we have created a nutritious, all natural, superior plant protein! Hemp is known as a nutritious super plant! It is high-quality source of protein, high in soluble and insoluble fibre, high in antioxidants and contains essential fatty acids. All hemp foods start from the whole hemp seeds and are processed in different methods to create each product. There are three main varieties: hemp seed, hemp seed oil & hemp protein powder. Our blend contains the highest quality hemp protein powder sourced from Canada. The hemp protein powder is derived from hemp seeds which are crushed, producing cold pressed hemp seed oil and seed cake, which is then milled down to make the hemp protein powder. Hemp protein powder has a complete amino acid profile, contains fibre, essential fatty acids and omegas 3, 6 & 9. Our Canadian hemp protein powder contains 65% protein concentrate. Why the 70% Vital Pea Protein and 30% Hemp Protein Powder blend? A blend combining our Vanilla Vital Pea Protein and Hemp Protein powder creates a superior complete plant protein, with fibre and essential fatty acids from the hemp protein powder. Together, our Vital Pea & Hemp Protein blend contains over 74% protein. The blend has all the benefits of the pea protein with added fibre, essential fatty acids, GLA, Vitamin E from the hemp protein powder. It is easily digestible, has a smooth texture and with the Vanilla flavour from the Vital Protein has a great taste! It is great for baking and in smoothies. Why would I benefit from taking the Vital Pea & Hemp Protein blend? Our Vital Pea & Hemp Protein blend contains all nine essential amino acids, which are not produced naturally by our bodies but play vital roles in our bodies biological processes. The blend is also all natural, and is suitable for almost everyone being gluten free, dairy free and vegan friendly. It has a high protein concentration at over 74%, supports increased energy, is easily digestible. It can be taken any time during the day and can be used to support weight management* (containing less than 100 calories per serve) and support muscle recovery pre and post workout. 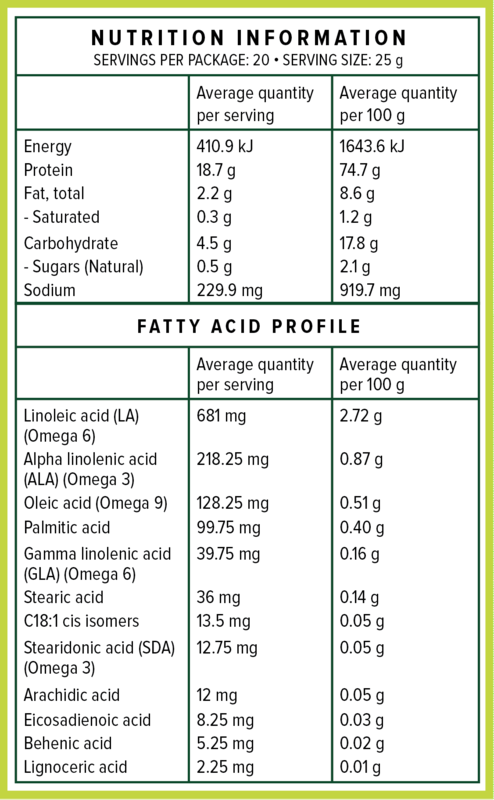 With a complete amino acid profile, the blend is so nutritious, it is the perfect snack replacement. Dosage: Dissolve or mix 25 g (approx 2 heaped tablespoons) into 200 mL of water, milk (non dairy is suggested), yoghurt, or natural juice of your choice. Consume 1-2 times per day depending on how much protein is advised to have in your diet. Always consult your healthcare practitioner as individuals may vary.